I talked about my experiences with the rental properties that my wife and I own recently. For the first and second rentals we've seen about 7% annual appreciation and 5-8% return on equity. Thats a pretty good investment. But then I wondered "hmmm.. what if I'd just bought a REIT instead?". Might I have also seen 7% appreciation and a 5-8% return via dividends? Possibly. That line of thinking brought me to the general question : How do REIT prices correlate to real estate prices in general? I'd assume that the market price of REITs will go up and down roughly equal to the increase or decrease in real estate values in general. Seems like common sense, so this should be an exercise of proving the obvious. To test this I decided to compare a REIT index fund to a general real estate price index. 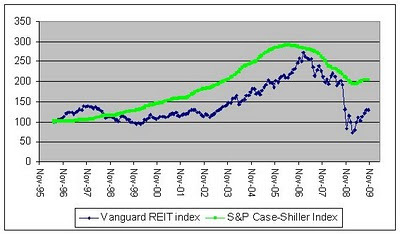 For REIT prices I chose to look at the Vanguard REIT index (VGSIX). For direct real estate values I used the data from the S&P Case-Shiller index off the S&P site. I then normalized both indexes to 100 starting in 1996 and plotted both up until most recent data for Nov. 2009. You can see that the correlation between the two is pretty strong. However the REIT index prices are a bit more volatile. That should be expected since the market can easily react and dump a very liquid REIT but actual physical property is much less liquid. If you exclude the last 13 months post Oct. 2008 then the trends of both are very similar. In the fall of 2008 the values of REITs dived drastically as a reaction to the real estate bust and credit crisis. The performance of REITS has been worse in this arbitrary snap shot mainly because of how badly REITs were battered during the recent recession. I could break down the numbers a lot more but I don't want to read a whole lot into this. The point was to see if theres a close relationship between REITs prices and real estate prices and I think the graphic shows that to be true in a general sense. REIT prices and real estate values are close in performance but REITs are more volatile.